Despite many politicians being in complete denial about the mounting evidence of a connection between certain insecticides and the collapse of bee populations, new research shows that those same insecticides are probably indirectly leading to bird die-offs, too. A new study published this month in Nature looks at data from the Netherlands which the researchers say shows a sharp decline in certain bird populations in areas where insecticides known as neonicotinoids were used the most. Neonicotinoids are among the new wave of insecticides that have been developed in the past 50 years. They were supposed to be revolutionary for the farming industry and were billed as less damaging for the environment and wildlife. However, study after study has linked them to a decline in pollinators and even to bee Colony Collapse Disorder, while a 2013 examination of peer reviewed literature called for tighter restrictions on neonicotinoid use as, used in the concentrations and amounts that we see on farms today, the scientists concluded there is enough evidence to suggest that these insecticides are harming bees and other insects who aren’t supposed to be targeted. Concerns have also been raised about the wider impact on wildlife beyond our pollinators. While neonicotinoids are billed as not being as toxic to mammals, and in particular birds of prey, scientific literature has suggested an unintended impact: by killing insects that the mammals eat, they may be driving down certain sensitive populations, and that’s precisely what the study from the Netherlands found. Interestingly the researchers from Radboud University in the Netherlands started their research not by exploring the impact of neonicotinoids, but by looking at two different data sets, one of bird counts, and the other of surface water measurements of the most common neonicotinoid, and through this the scientists were able to track the decline in bird numbers during the period of 2003 to 2010 while leaving the door open for other possible causes of bird population decline. They found that there may be several factors contributing to the fall in numbers, such as an intensification of farming which often means uprooting bird habitats, like digging up hedges or dismantling barns. Still, the researchers found that the presence of imidacloprid, one of the leading neonicotinoids, is incontrovertibly impacting birds and may be the main cause of bird decline in the region. They found that if ground water had just 20 nanograms of neonicotinoid per liter, there was a 30 percent fall in bird numbers during the study period–and what’s more, some areas had pollution levels that was 50 times higher than that figure. 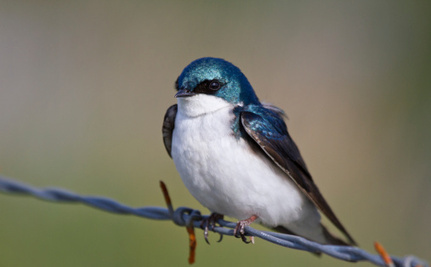 In total, the researchers found that 14 out of 15 common insect-eating bird species, like barn swallows, tree sparrows and starlings, had suffered sometimes dramatic population declines. Research similar but not identical to this has been dismissed in the past because it didn’t control for other factors, but this research did, yet the pattern still emerged. That is why lead researcher Hans de Kroon believes its time to take this problem seriously because, if neonicotinoids are indirectly harming birds, they’re probably harming other wildlife that prey on insects, too. Goulson also highlights that unlike the Netherlands, the UK (and much of Europe) isn’t monitoring neonicotinoid pollution. The UK agency responsible for overseeing matters dealing with the environment and wildlife, called Defra, remains stalwart that the research isn’t overwhelming and that, at the moment, there isn’t compelling evidence to show a definite link between neonicotinoids and harm to wildlife. Defra says that these kinds of pesticides are safe when used as recommended and points to the admittedly (usually) rigorous short-term trials carried out by neonicotinoid producers. The problem though is precisely that they are only short-term trials. Manufacturers haven’t used longer-term systematic trials but if they did, scientists say the data would show the harms neonicotinoids can create over longer periods of time. It was hoped that this message was, at last, getting through, when in 2013 the EU imposed a two-year suspension of thre neonicotinoids, but it emerged the suspension is largely toothless because the EU is failing to track data during this time, and a two year suspension is unlikely to give any meaningful data anyway. We have to be clear that this latest study implies a link and not causation, but because this adds to a wider body of data that all suggests a link, the evidence for probable causation is growing ever more formidable. All this leads us to ask: how much scientific data do we need, and how many impartial experts need to speak out, before our politicians will act? Or perhaps the better question is, how many animal populations have to collapse before our governments see fit to do something and actually tackle the issue of neonicotinoids? Leave a Reply to audio language translator free Click here to cancel reply.